A centerpiece of childhood activity for families from Milo and Derby, Maine, was Ed Wingler Auditorium events in the Milo town hall building. Growing up in the 1950’s and 60’s in a small town had its advantages. The auditorium was used for band concerts, talent shows, school dances, plays, assembly meetings, and high school basketball just to name a few. Basketball at the Wingler Auditorium was a favorite. The main floor was likely the smallest basketball court in the state of Maine with limited seating on 2 sides, a stage at the edge on one end, and entrance doors at the edge of the court on the other end. A balcony on the upper floor covered 3 sides, so overall the seating was 2-300. The roar of the fans was always deafening. Some jokingly referred to the layout as a cracker box. From the balcony, if you looked straight down all you could see were the lines for out of bounds. Milo High School which I attended and Brownville Junction High about 8 miles away were fierce rivals in the 1960’s. Both had a great year in 1963. In the 1963 Maine high school Class M East quarterfinals, Brownville Junction was ranked #1 and defeated Woodland 50-42. Milo was ranked #2 and defeated Sherman 46-41. Both won in the semifinals. Brownville won 59-52 over Easton, and Milo won 61-44 over Lubec which placed the rivals head-to-head for the Eastern Maine finals. A win would mean going to the state finals, and the game was an electrifying and closely fought battle. In the 1963 Eastern Maine basketball finals, #2 Milo High School defeated rival #1 Brownville Junction High School 55-51 for the Eastern Maine Class M Championship. In the 1963 Maine State Finals, Milo played the Western Maine Champs from Greely High, which was 137 miles away, and they lost 45-42. I’m reviewing that last phrase “…they lost 45-42″. Please forgive my poor grammar matching subject and verb if you’re confused about who won the Maine Class M 1963 State Championship high school basketball game. Beating a rival 8 miles away who was ranked #1 was more important than an unknown school from 137 miles away. Visit the Milo Historical Society Museum the next time you’re in town. They have lots of trophies on display. Hopefully there’s some donated from 1963. 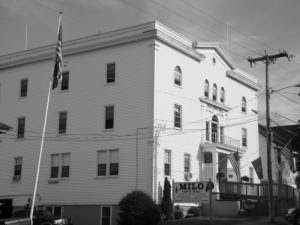 Ed Wingler Auditorium events in Milo, Maine, include their annual Milo High School banquet and reunion usually held in July. Attend and you may just meet players from that phenomenol basketball team of 1963 for a blow by blow of the entire championship run.